We understand that merchants always have problems with consignment notes when it comes to shipping. But don’t worry! There are easier way to print consignment note of your preferred courier service providers (Poslaju, Citylink, Skynet, Fedex, UPS, DHL & etc). **This feature only available for webShaper sohoStore & bizStore package. 1. Define Shipping Label Template. i. Go to Orders and click Shipping Label Editor. ii. Choose a template and edit the settings. 2. Edit via Ship Label Emulator for Label. i. Drag & Drop the labels to the correct position in the consignment note. Note: You can choose additional information that you want to insert such as Company Website and Order Items. ii. Configure your shipping label templates and Save. 3. Print Consignment Notes for Your Order. i. Go to Order > View Orders. ii. Tick order(s) you would like to print. iii. Click on Print Shipping Label from Template. iv. Choose template you have created, to download consignment note as .pdf file. 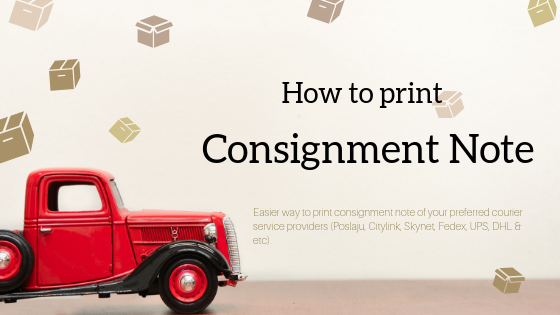 For more information, checkout our tutorial page to Print Consignment Note.